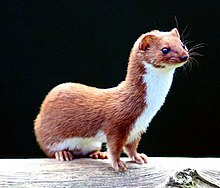 The least wheasel (Mustela nivalis), eften simply cried wheasel, is the smawest member o the genus Mustela an o the faimily Mustelidae (as well as the smawest o the Carnivora), native tae Eurasie, North Americae an North Africae, tho it haes been introduced tae New Zealand, Australie, Maltae, Crete, Bermuda, Madeira Island, the Azores, the Canary Islands, Sao Tome, the Falkland Islands, Argentinae an Chile. ↑ Tikhonov, A.; Cavallini, P.; Maran, T.; Kranz, A.; Herrero, J.; Giannatos, G.; Stubbe, M.; Conroy, J.; Kryštufek, B.; Abramov, A.; et al. (2008). "Mustela nivalis". IUCN Reid Leet o Threatened Species. Version 2008. Internaitional Union for Conservation o Naitur. Retrieved 21 March 2009. This page wis last eeditit on 1 Apryle 2017, at 04:26.